"Carefully transferred from cardboard. Mastering was a challenge! Compared to the raw material, the result sounds surprisingly good. 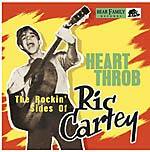 Only one '50s rocker made his debut single as a tie-in with Orange Crush soda pop. 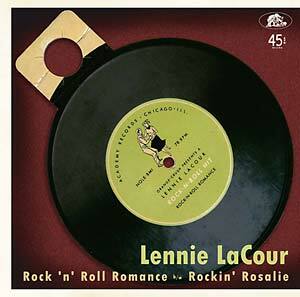 Lennie LaCour's one-sided cardboard seven-inch 78 rpm pressing of 'Rock-N-Roll Romance' came attached to six-packs of the carbonated beverage in 1956, causing quite a sensation around Chicago and surrounding regions. LaCour waxed another jackhammer blazer, 'Rockin' Rosalie', as a separate platter on Chicago's Academy imprint. The super-rare original 'Rock-N-Roll Romance' from that long-ago soda pop freebie 78 graces one side of this delightful single, backed with Lennie's Academy release 'Rockin' Rosalie' -- rendering it a virtual greatest hits 45. So pop open a cold Orange Crush and prepare to hit the dance floor -- Lennie LaCour's rocking the house! Born outside of Natchitoches, Louisiana and largely of French Creole descent, LaCour developed into a multi-faceted entity: singer, songwriter, and eventually producer and label owner. Lennie migrated up to Chicago and sang with Al Peterson's orchestra before winning a contest to sing a rock and roll jingle for Orange Crush, and he was off and running. After his Academy stint was over, LaCour was advised by Leonard Chess to launch his own label, so he formed the Lucky Four logo, issuing No Privacy under his own name and then as The Big Rocker in 1961. Relocating to Milwaukee, Wisconsin, Lennie established another imprint, Magic Touch, that released seminal soul singles by Harvey Scales & The 7 Sounds led by their killer '67 two-sider 'Get Down' b/w 'Love Itis'. 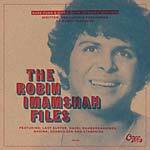 The maverick producer continued to record right into the 21st Century."